Stacy Horn » Blog Archive » Isn’t this a terrible piece of information? Isn’t this a terrible piece of information? UNITED NATIONS (Reuters) – More people kill themselves each year than die from wars and murders combined, but most suicides could be prevented, two international experts on suicide said on Friday. Some 20 million to 60 million try to kill themselves each year, but only about a million of them succeed, said Dr. Jose Manoel Bertolote, a mental health official at the World Health Organization in Geneva. I cut and paste this from somewhere, I forget where, but it’s from this month. In my mind, I immediately had this bird’s eye view of the planet, showing millions of people furiously trying to end it all. It was just so sad. We’re not on the ball about something. Or was it always like this? If you went back a hundred years would the percentage be the same, even if the numbers were smaller? 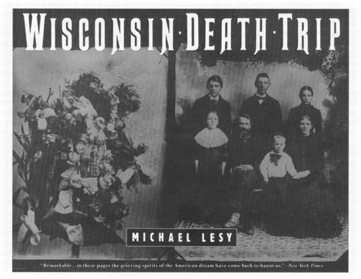 It reminds me of a very moving book, Wisconsin Death Trip. The author, Michael Lesy, found an archive of photographs taken in the 1890’s of a town in Wisconsin called Black River Falls. He went through old newspapers and found that it was a particularly sad time. People kept dying, often by their own hand. It’s an incredible book. I read it in one sitting and when I was done it was like walking out of a movie. You know that feeling you have for a few seconds after a movie, like you were in a dream and have to come back to the real world? I was struck by the global suicide numbers, too. I read about it recently in one of the Yahoo news things I have on my front page. I was also struck by the fact that in developing countries the most common means of suicide is pesticides! I bought Wisconsin Death Trip many years ago in college when it first came out. It’s not a book one forgets. A year ago I purchased it again, just to have. Much of the world revolves around issues of survival, and if you stumble, there’s not always a lot of solace to be drawn from your fellow man. I read yesterday in the New York Times that chronic illness is grounds for divorce in India. In this kind of environment, I can well imagine that someone might think that drinking pesticide is the best option.